Proverbs 1:5 says: "A wise person will listen and take in more instruction, and a man of understanding is the one who acquires skillful direction"
When applying this Scripture, one needs to look at the board carefully, and plan ahead. One cannot succeed in Go without doing these things. Proverbs 1:10-16 says: "My son, if sinners try to seduce you, do not consent. If they keep saying: 'Do go with us. Do let us lie in ambush for blood. Do let us lie in concealment for the innocent men without any cause. Let us swallow them down alive just like She'ol, even whole, like those going down into a pit. Let us find all sorts of precious valuables. Let us fill our houses with spoil. Your lot you ought to cast in among us. Let there come to be just one bag belonging to all of us'- my son, do not go in the way with them. Hold back your foot from their roadway. For their feet are those that run to sheer badness, and they keep hastening to shed blood." When applying these Scriptures, one must understand that one's opponent will try to lead one into a trap. This means constantly being on guard for any kind of trap. Also, the opponent may use baits to entice one into falling into the trap. One part of these Scriptures shows that hastening to fight without prior strategic reason results in loss. An example of this is the strategy of Cosmic style- the style uses a large moyo to try and lure the opponent into invading, and then attacks the invading group forcing it to be small while solidifying a large amount of territory in the process. Proverbs 1:17 says: "For it is for nothing that the net is spread before the eyes of anything owning wings." This Scripture shows that one cannot catch a fast moving player with slower moving tactics, and it also means that the one observant and taking a step back will have the advantage over one who blindly charges into attacking the opponent's groups and territory. Luke 16:1-13 says: "Then he went on to say also to the disciples: A certain man was rich and he had a steward, and this one was accused to him as handling his goods wastefully. So he called him and said to him, what is this I heard about you? Hand in the account of your stewardship, for you no longer can manage the house. Then the steward said to himself, what am I to do, seeing that my master will take the stewardship away from me? Am I strong enough to dig, I am ashamed to beg. For ah! I know what I shall do, so that, when I am put out of the stewardship, people will receive me into their homes. And calling to him each one of the debtors of his master's he proceeded to say to the first, how much are you owing my master? He said, a hundred bath measures of olive oil. He said to him, take your written agreement back and sit down and quickly write fifty. Next, he said to another one, now you, how much are you owing? He said, a hundred cor measures of wheat. He said to him, take your written agreement back and write eighty." These Scriptures show the same principle as the one of the thirty six strategies that says to befriend states that are far away. This allows one to gain advantage by synergy instead of only on one's own strength- or in Go, using far away groups in a synergy of cooperation. One thing to notice is that this passage is in Luke- part of the New Testament. This shows that all throughout the Bible there can be many strategic concepts that one can learn from. All Bible Principles of conduct also have a much more strategic purpose. In ancient Israel, the Law was in place, not only to maintain order, but to keep the people in one accord with each other and their leader which is a key Principle of strategic operations of a government and even in military campaigns. The two greatest commandments has shown to be just that. Now, there are key differences between Laws and Principles in the Bible as well. 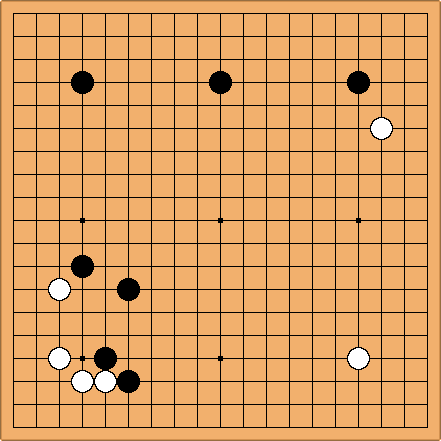 The Law said not to steal, the Principle is not to become greedy and thus can be applied to a Go player who is greedy in the game which leaves him vulnerable to counter-attack. Anon: Another interpretation of Proverbs 1:17 is "don't use a net to try to capture something more than one eye"
TheBigH: Proverbs 10:4, "He who has a slack hand becomes poor, but the hand of the diligent makes rich." The 10 commandments can be used liberally. For example "Thou shalt not kill" is poor advice, but "Thou shalt not covet" can be a useful warning against greed. Exodus 9:1: Let my people go.